Turkey has accepted the last of thousands of Meskhetian Turks from Ukraine whom it has agreed to take in as part of an ambitious resettlement program for the multiply exiled post-Soviet people. 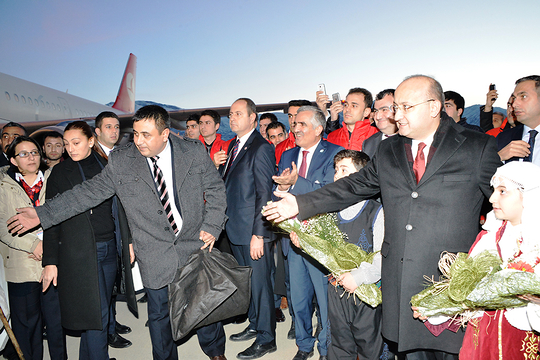 On November 16, 185 Meskhetian Turks from Ukraine arrived in Turkey, the sixth and final group in a resettlement program launched by Ankara in 2015. Of all the peoples deported en masse to Central Asia and Siberia during the Soviet period, the Meskhetian Turks have proven among the least successful in their attempts to return home, and speaking to Turkish media some expressed hope that this would be their final stop after being exiled several times over the past seven decades. The Meskhetian Turks trace their origins to the historic province of Meskheti, a large portion of which today lies in Georgia’s south-western province of Samtskhe-Javakheti, along the border with Turkey. Some prefer the moniker “Ahıska Turks”, referring to the region’s capital of Akhaltsikhe. After the Ottoman Empire’s conquest of the region in 1578, many local inhabitants converted to Islam. That’s about as far as some Meskhetian Turks are willing to agree on their origins — some believe their ancestors to have been ethnic Turks who were culturally influenced by their Georgian neighbours, while others believe the community were Turkified Georgians. When Nikita Khrushchev “pardoned” the deported peoples in 1956, the Meskhetian Turks were conspicuously absent from his list. Further restrictions on their movement were lifted in 1968, but few Meskhetian Turks ever made it back to their villages. As Turkey had joined NATO in 1952, their historic homeland had become a sensitive border zone. Tens of thousands of Meskhetian Turks moved to Azerbaijan and southern Russia, which they saw as the first step to their eventual repatriation. Many of the Meskhetian Turks who had remained in Central Asia were forced to leave in a hurry. In June 1989, vicious inter-communal riots broke out in the Fergana Valley region of Uzbekistan, largely targeting Meskhetian Turks. More than 100 died, and 17,000 Meskhetian Turks were evacuated to Russia by the Soviet military. Over the next two years, 90,000 Meskhetian Turks left Central Asia. As a newly-independent Georgia grappled with decommunization, it was only natural that the question of the Stalinist-era deportations would arise. However, the country’s instability and ethnic nationalist rule of Zviad Gamsakhurdia proved an obstacle to welcoming back tens of thousands of Muslim Meskhetian Turks to the young state. Georgia eventually committed to allowing repatriation of Meskhetian Turks in 1999 when it joined the Council of Europe, but a draft law only surfaced in 2008. That law on the repatriation of repressed peoples formally permits the Meskhetian Turks to return to their ancestral homeland. However, Georgia's dim view of dual citizenship complicates its implementation, as do negative views of Muslims in Georgian society and fears of returnees bringing new socio-economic pressures on an already impoverished region. As a 2011 study by the European Centre for Minority Issues (ECMI) concluded, the hurdles to repatriation are numerous — not least because the descendants of the deported Meskhetian Turks now number nearly 450,000 worldwide. Most of the Meskhetian Turks whom Turkey is taking in are fleeing a conflict zone, primarily Slovyansk and Kramatorsk, towns in the Donbas controlled by pro-Russian separatists in 2014 but which have since returned to Ukrainian government control. Around 11,000 Meskhetian Turks lived in Ukraine as of 2014, and not only in the Donetsk region. Many settled in the Kherson and Mykolaiv regions during the Soviet period — and while the war never reached these regions, the resettlement program allows local Meskhetian Turks to flee poverty instead. When recently reporting on Crimean Tatar communities in the Kherson region, this author heard from locals that some Meskhetian Turks were leaving the area for just this reason. As Fuat Ucar of the World Congress of Meskhetian Turks told Daily Sabah in 2015, Ankara had agreed to accept at least 3,000 people from Ukraine. These Meskhetian Turks will join 35,000 of their compatriots already living in Turkey (primarily in Antalya, Bursa, and Istanbul), a testament to the diaspora’s legal and political activism in Turkey. Earlier this month, Meskhetian Turkish organiser Ziyatdin Kasanov told the Anadolu News Agency that the Turkish state had started issuing ID cards to the many Meskhetian Turks who had lived in the country for over a decade without documents. The new arrivals are being settled in the Bitlis, Erzurum, Erzincan, and Kars regions of eastern Turkey. The state construction company TOKI has constructed purpose-built houses for each family, and local authorities offer a modest stipend for a limited time. As of September, Ankara had granted citizenship to 585 Meskhetian Turks, and aims to have naturalized 1,000 before new year.